Tackling these hot topics is: NOT about pontificating our view and waving fingers from the pulpit NOT about putting up walls, divisions and barriers. Jesus came full of both grace and truth (John 1:14). We, Jesus’ followers, really can be full of both grace and truth. We are empowered by Jesus to live in this world, not be taken out of this world, by the filling of His Spirit of grace and truth. I believe, we really can both embrace others and call one another to more in Christ. Jesus did. One case in point is the women caught in adultery (John 8:1-11). Jesus stood up for her, clearly cared for her, loved her, silenced her bullies and with the foundation of such an embrace, invited her to leave her sin and find a new way. Jesus typically spent way longer on the first part of the conversation, showing love, acceptance and understanding than on the second part about leaving sin. The exception was with the Pharisees, the religious people that thought they already had everything all figured out. There, Jesus leapt to bold statements, pointing out the error of their ways. In the example of the women caught in adultery, we often want to leap to the second part of the conversation when we’ve barely introduced ourselves, and certainly not showed true welcome and hospitality. With this woman, Jesus spent most of the time showing that He was for her, not there to condemn her. Only when the crowd disappeared, did He invite her to leave her life of sin. He made this one statement when she already knew and felt his care and acceptance of her. How about you and me? Are we making sure people know of our care and acceptance, and of God’s care and acceptance through us, first and foremost? How do we engage hot topics both inside and outside the church with both grace and truth as Jesus did? As we get started on this series of hot topic blogs over the next few weeks, I realize, I really need some guidelines for myself. If you’re going to wade into these topics in your church or neighbourhood you need guidelines for this too. 1. Seek to understand – Try to understand the issue from all sides. Bring an attitude of discovery and curiosity to the topic and try to understand why people are on different sides of the controversy. Listening and showing respect goes a long way. Learn where and why Christians – born-again, Bible believing Christians - can be on all different side of the controversy. Before you respond, empathize. I think we worry if we empathize, if we show understanding for another “side”, people will assume we are believing that “side” fully. To empathize is to treat people as loved creations of God. We can empathize deeply with someone, their struggle, how they have been treated by the church, without even ever coming to agreement or disagreement on whatever the “issue” might be. Show and model empathy. 2. Teachability - Admit you don’t have it all figured out. Show humility. Be open to the idea that your conclusions might be faulty. 3. Examine your assumptions – Be careful not to assume where people or your congregation land on a certain issue. Most of our congregations have great diversity on issues and we must remember that in your congregation there will be people who are affected personally by any given issue. Furthermore, do not make leaps for people. Our minds can go from “if you believe this…” to “you must also believe that…” very quickly. That is unfair. Christians are terrible for this, people cross one theological “t” and then we assume we know what they believe about every issue because based on that “t” we’ve put them in a certain camp. Judgment destroys relationship. Judgment destroy further meaningful conversation. 4. Repent - Acknowledge where Christianity has gotten it wrong or been hurtful on the issue. Even if you disagree with someone or a group’s behaviour we, as Christians, have a lot to apologize for in terms of how Christians have treated people or people groups. 5. Create the environment - Create the right environment to talk about controversial issues. Know your audience and pick the right time, place, and environment to talk about these difficult issues. Most issues are better talked about one-on-one or wrestled with in small groups. If we talk about hot topics from the platform on Sunday it should be to provide permission to talk about the issues further and we should provide a setting for people to ask questions, challenge, and re-examine Scripture on the topic. 6. Attitude matters - If someone disagrees with you they are not a bad person, they simply disagree. In terms of our attitude we need to remember to show care for human beings over and above any issue or disagreement. We also must remember we are not to hold non-Christians to Christian standards. If our attitude is to learn and help others come to greater understanding of an issue, rather than converting people to our point of view, everyone will go away richer, regardless of who “wins”. 7. Fruit of the Spirit test – Do your conversations and presentation of the issue pass through the grid of the fruits of the spirit? As you’re engaging on this topic are you able to do it with God’s love, joy, peace, patience, kindness, goodness, faithfulness, gentleness and self-control (Galatians 5:22-23)? 8. Trust God to bring up truth – I have found God absolutely faithful to bring up Himself and His ways in conversations. As I enter into meaningful conversation with people or groups of people (e.g. a youth group), as we build trust and acceptance, God, in His timing, brings up the deeper issues, on both sides (!) and brings truth into the light. He is the faithful one, full of grace and truth. 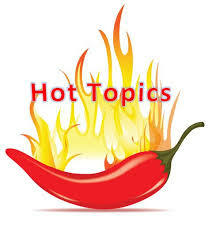 There are no shortage of hot topics in the church. Let’s not pretend they are not there and not happening. Let’s engage with grace and truth. Let’s keep these guidelines in mind as we engage together around hot topics the next few weeks. Help me out, will the guidelines I’ve laid out help? What would you tweak? What would you add?